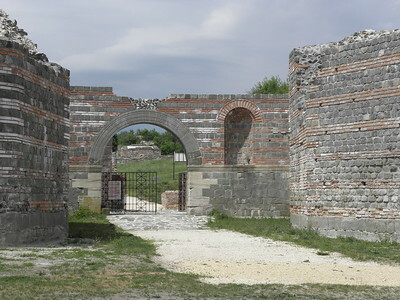 Gamzigrad-Romuliana, the imperial Palace of Galerius, is one of the most important Late Roman sites. Construction works started in 289 by the tetrarch Galerius to mark the place of his birth after a victory over the Persians. It was given the name Felix Romuliana in memory of his Queen mother Romula, a priestess of a pagan cult. Like Diocletian's Palace in Split, the palace was designed to be a representative Imperial residence, housing an abdicated Emperor while retained the imperial symbols. Archeological excavations in the fortress have unearthed the remains of a palace with exceptionally fine mosaics, baths and impressive gates. Among the important finds from the site are portraits of rulers made from the Egyptian purple stone called porphyry and coins that help to date the complex. Felix Romuliana, the fortified palace, is a pleasant surprise. It is situated in the countryside of eastern Serbia. I arrived around midday, just when the sun broke through again. Two things stood out immediately: the almost perfect walls around the palace complex, and the ticketbooth at the entrance. This was my first taste of “Serbian tourism”: a bus full of schoolchildren was already there, and later another group arrived (I sneaked up on them and believe they were Belgian tourists). And I paid my first entrance fee here in Serbia. It costs 200 dinar, just under 2 EUR. The palace walls were made out of opus mixtum, a mix of brick and stone. This results in a fine decoration all along the fortifications. It looks so good (also from a distance when you’re driving up the road), I initially thought it was a reconstruction that had gone a bit over-the-top. But the walls are all original. 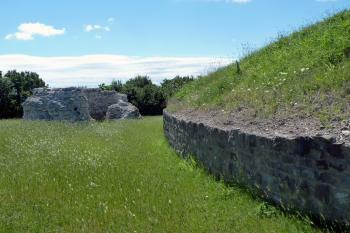 The site within the walls is mostly overgrown with grass. I read in the AB evaluation that they plan to leave it this way, as more archeological digging would lead to more harm. You can walk around freely, except for the mosaics on the ground there are no forbidden areas or warnings not to touch anything. Also special is the visual link that has been made between the palace and the two tumuli on a nearby hill. This is were Galerius and his mother were buried. For Emperor Galerius it was the spot of his apotheosis: the ceremony where he turned from man into a god. The best place to ponder these kind of sacred connotations is from the terrace of the little on-site café, which has great views of the palace with the tumuli in the background. It’s an atmospheric place in general, and there are many stories to be told. After I left Gamzigrad, I drove on to the nearest large city: Zajecar. I stayed overnight, and visited the local museum. This is a good addition to a field visit, as the most important findings are kept and displayed here. It was a surreal museum visit though – the staff all seemed very busy at their offices, and a ticket for sale had to be retrieved from a drawer. Then I was left on my own, wandering the 8 exhibition halls or so. All the lights were turned off, so I switched them on one by one myself. And yes – I switched most of them off too after I had finished a room. The displays in the hall on the ground floor were the best, among them the greatest mosaics that were discovered at Gamzigrad. On the first floor there’s a large model of how the fortified palace would have looked like in its heyday. Very impressive. 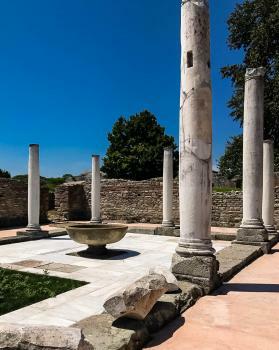 Visited in July 2018, Felix Romuliana was a temple complex created by Galerius, a Roman Emperors who used Christians as part of the spectacles of the Ludi (Roman festivals). Incidentally, during his reign as Caesar, he came out with an “edict of toleration” (311 CE), which despite his strong prejudice against the Christian religion, ended Christian persecution. Going to the site was not easy. I wanted to do it on my own (i.e. public transportation). However, several blogposts did not recommend public transportation. Several online posts were suggesting to rent a car. Others were suggesting to book a trip via travel agencies or via private guides. I decided to look for an agent. Luckily, a colleague from Belgrade introduced me to Miross Travel Agency (Thank you Miross for saving me and for a very amazing itinerary. I give you 5 stars for an outstanding service). Its staff members are most helpful (Another 5 stars!). They drafted an itinerary and I gladly took it. My guide was Goran. I was happy that he knew Serbian history very well and that included some historical notes regarding Galerius. The site is a 3-hour drive from Belgrade. At first, we navigated the expressway and after two hours, we exited towards the city of Zaječar. From the exit toll, another hour-long drive along a vast plain of sunflowers and wild shrubs. When we reached Felix Romuliana, I thought it just popped out of nowhere! From what I learned from my guide and Maria, the person-in-charge who welcomed us at the site, the palace was believed to have been built as Galerius’ palace of retirement. At the same time, it was intended for the deification of her mother Romuliana (something which will be discussed later). Prior to the excavation of Felix Romuliana, many archaeologists believed that Galerius built a massive complex but nobody ever found the actual site until 1984. When archaeologists came across the ruins in the late 1800’s, they mistook it for a Roman military camp. It was only in the 1950’s when social scientists excavated sophisticated mosaics, white marble columns, and statues of Roman gods that the site was considered as something grander than a military base. 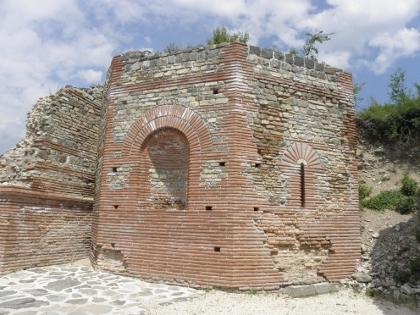 According to Maria, it was only in 1984 when the site was identified as Galerius’s complex due to the discovery of an ornamental arch with the inscription Felix Romuliana (do not look for it in the site, it is now kept in the Zaječar Museum for security reasons). Also, archaeologists discovered a pilaster strip on the eastern gate depicting the 2nd Tetrarchy, with Galerius and Constantius Chlorus at the top, below them the Caesars Severus and Maximinus Daia, and then the retired Augusti Diocletian (yes, the same Diocletian who was responsible for the persecution of the Christians) and Hercules (I don’t remember if they were referring to the mythic figure). Like the inscription, all of these are emplaced in the city museum but replicas are available for the pleasure of the visitors. As I walked through time, I imagined how people inside the complex lived their lives. I was even intrigued by the mosaic of Dionysus, which was also discovered in the 1980’s (no – I did not see the mosaic itself – Maria just mentioned it. 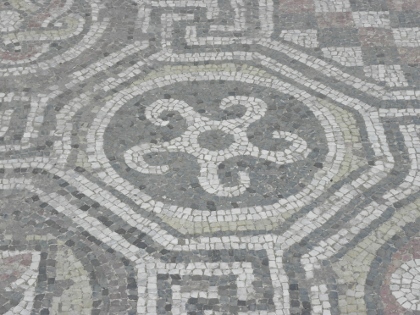 Today, this mosaic is in the museum at Zaječar). My wild imagination was convinced Galerius was a devotee of the playful god (but I wondered why it was not Bacchae because Dionysus was an Ancient Greek god). Archaeologists uncovered towers, ramparts, walls (fortifications), two monumental gates (entrance is in the west but do navigate the eastern gate and travel towards the hill, there’s a surprise on top of it waiting for you), a palace, a basilica, temples (a small and a large one), and a bath (spa). My travel to the site was extended to the Magura Hill (starting point: Eastern Gate). At first, I was hesitant to follow the trail. It was a very hot day. But Goran was persistent. I did not know how long the trail was but it took us about 45 minutes to go to the top of the hill. I was happy I said yes to Goran’s persistency. The topmost part of the hill was an important site. Romuliana’s and Galerius’s mausoleums are emplaced there. Few yards from their mausoleums are their respective tumulus (where their wax figures were burned during their respective apotheosis – or their deification). It made sense why the site was called Felix Romuliana. Felix was a Latin concept that referred to the deification of a human individual. When Galerius’s mother underwent the apotheosis, Galerius changed the complex’ name into Felix Romuliana, which meant the complex dedicated to the goddess Romuliana. For more info on Felix Romuliani, please check my blog at tanghal-kultura.org. I went to Gamzigrad-Romuliana on Thursday of last week (late July). I don't know if I would recommend Serbia in high summer, as it was over 100 degrees Fahrenheit most days. But the site itself was beautiful. I was staying in Belgrade, and hired a driver to take me to the site instead of staying locally for the day. The ruins themselves were beautiful. Not as spectacular as other ancient Roman sites, but Magura hill (where Galerius and Romula underwent apotheosis to become gods), was beautiful and interesting. If you're in Belgrade, it's a three hour drive on a very open highway (not a small mountain highway like you get in western Serbia). 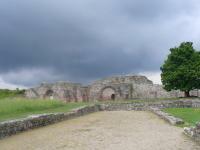 I have a longer review and more pictures here: UNESCO World Heritage Site: Gamzigrad-Romuliana, Palace of Galerius. 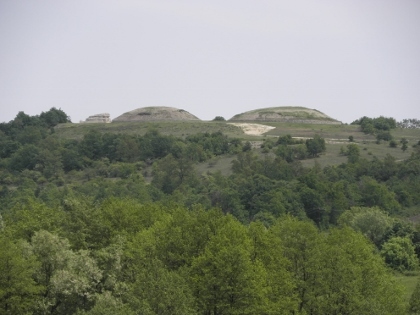 None of the 4 previous reviews of this WHS has mentioned a visit to Magura - the hill situated 1km to the east of the Palace (but still within the inscribed area) which the Nomination File describes as a “Memorial Complex”. As Els mentions, the tumuli on this hill are clearly visible on the skyline from the palace area. In June 2017 we had a car and were able to drive, so it is perhaps easy for us to say that everyone should do it, but it does provide both a fine view of the Palace from a high point and a much better understanding of the rather strange process of “Apotheosis” by which Galerius and his mother Romula were deified. The motorable track up to Magura starts by turning left from the car park (the main exit is to the right!) and goes around the southern wall. It was partly hidden by high uncut June grass when we were there but just keep following it uphill away from the palace and you will eventually reach a small area with a “P” sign just below the tumuli. We found it interesting to discover that the purpose/function of these ruins (i.e a retirement palace for Galerius from the period of the Tetrarchy) was only established as recently as 1984. Before that they were known by the name of the nearby village (“Gamzigrad”) and were thought to be simply a large Roman military camp/fort. Excavations soon uncovered mosaics etc and buildings which indicated that it must have been much more important than that, but what exactly? If you go to the Museum in Zajecar do not miss the small black block with some decoration and inscribed “Felix Romuliana” which finally linked the site to previously known written Roman sources which referred to a “Romuliana” in Dacia and linked it to Galerius and his mother (The block is rather hidden in the stairwell of the ground floor which, as Els mentions, lives in semi darkness!). A statue assumed to be Galerius himself is also on show in the main display room. The function of Magura however was only established during digs between 1989/93. One of the upstairs rooms in the museum has on display a fragment of chain mail excavated from the Galerius tumuli which shows signs of having been burnt alongside the wax effigy. The Apotheosis of Galerius took place in 311 AD. 26 years later the Tetrarchy was finished, “Rome” was Christian and Constantine the Great was given a Christian burial in the Church of the Holy Apostles in Constantinople. You are standing at a “punctuation point” in History – the location where the final deification of a ruler in the Greco-Roman tradition took place at the end of a line going back to Philip II of Macedon in the 4thC BC! A couple of points about visiting the main site. I wonder whether there has been a policy change regarding display of the mosaics at the site since Els reported and took photos. During our visit they were all covered by sand/gravel, apart from one which has wooden roof over it. There was no evidence that the sand was ever normally swept back to expose them. We arrived early and there were very few other tourists present during our visit but the on-site staff spent most of their time having coffee and chatting to each other near the souvenir stall - it was purely by luck that we discovered that there was a room in one of the towers by the main entrance which is open to visit but not well signed at all. I visited this site few days ago. It's not so difficult to reach if you're traveling by car. Few kilometers from the main road and you are there. The significance of this place is great for Roman history, Galerius, Caesar at the time when Diocletian was August. Place can be very quick visit. They are still working on the excavation, with support from the German government. An interesting fact is that the Galerius was one of the biggest opponents of the Christians, and continued their fierce persecution and murder after the death of Diocletian. Admission is 200 dinars (less than 2e). Gamzigrad Romuliana is a bit off the beaten track Wh site (as all of Serbia is), but really worth to see. It is not a great adventure to go there – but requires some time. Can be done as a day trip from Belgrade – providing you have your own vehicle, and you get up quite early. Most visitors will approach Gamzigrad from the Belgrade – Nis motorway –as we did it. There is a huge brown signboard before the exit, so you cannot miss it. From trhe motorway it is less than 100 km, but be prepared, road conditions are quite various. After a couple of km of really good road we had to make a detour on curvy and humpy-bumpy country roads. In a sunny summer day it could have benne fun – driving through the Serbian villages. At night, in a thunderstorm it was a nightmare. A road seemed to be endless, but after almost two hours we reached Zajecar. This sleepy provincial town (the name means something like Rabbitville in Serbian), proved to be very friendly and surprisingly good looking. We found a cheap hotel (USD 30 for a double) and prepared ourselves for the next day in Ganzuigrad. To reach Gamzigrad from Zajecar is easy, the road is well signposted, and in the sunshine the whole area looked much friendlier than last night. We first could see the site from the narrow tar road leading to the entrance through the fields. It is a fantastic sight. With its massive towers and walls the palace of Galerius still rules the area after 1500 years. For a historian it is even more important – as the almost only remain of the late Roman military architecture in this region. At least none of them is so huge. Early explorers believed the ancient ruins to have been a Roman military camp, because of their size and numerous towers. Coming closer, in the parking lot we had to realize, that it is bigger then we thought – the walls are at lest four meters high on their highest point. We were offered a golf car from the parking lot to the entrance – the price is included in the entrance fee. Inside there is a small museum, where a knowledgeable guide – presumably an archeologist – explained us the story of the building in bright English. Ha told us that, systematic archaeological excavations conducted since 1953 revealed that the site was, in fact, an Imperial palace. It was conceived and built by one of the Tetrarchs, Emperor Galerius, the adopted son and son-in-law of the great Emperor Diocletian. Galerius started construction in 298 (after a victory over the Persians that brought him admiration and glory) to mark the place of his birth. The name Felix Romuliana was given in memory of his mother Romula, who was also a priestess of a pagan cult. The complex of temples and palaces served three main purposes - a place of worship of his mother’s divine personality, a monument to his deeds as emperor, and a luxurious villa for Galerius. Romuliana survived until it was plundered by the Huns in the mid 5th century. Later the site became a humble settlement of farmers and craftsmen, finally to be abandoned at the beginning of the 7th century with the arrival of the Slavs. But even though it is a pity that so few tourists dare to put this site (and Serbia)on their travel plan. The Tetrarchy: Felix Romuliana was a Roman palace built commecning 297 by Galerius to commemorate a victory over the Persians at Narses. It was located in the region of his birth place and named after his mother . It was possibly conceived of as his "retirement home" as per the rules of the Tetrarchy! However the death of the western Augustus, Constanius, in 306 led to Galerius becoming the "senior" Augustus and upgrading the grandeur of the structure.